What I didn’t realize: It takes a little bit of an effort to track down works of early Nobel Laureates. Did I set a time frame for completion? Nope. No way. There were 107 Nobel Laureates then, and I had no idea how long it would take me to find and read each chosen title. The trouble started with the first recipient, Sully Prudhomme. 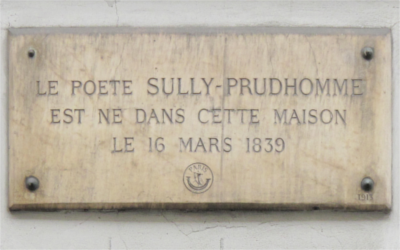 As a French poet, Mr. Prudhomme understandably wrote poems in French. I have never learned to speak or read French. What's the big deal? Why not find an English translation? A quick search on WorldCat.org (an awesome catalog of holdings of libraries around the world) proved that even a French volume would be difficult to get, as the closest libraries with Sully’s titles are few and far between, if not across the ocean. In the end, I found a few of Sully’s poems in English through Google and called it good. Of the three other laureates I read, two of the titles I had to borrow through interlibrary loan. One was actually available at LPL, "The Provinces of the Roman Empire: The European Provinces," but it wasn’t exactly a light summer read (it’s since been withdrawn from the collection). This was going to take me forever. What I imagined to be a daunting task ... actually was. I learned quickly that it was OK to put aside — and even let go of — a challenge. My To Be Read pile was large enough as it was. There were other things I wanted to read — much more exciting and interesting things (to me). My Nobel challenge was a time consuming and intimidating endeavor. I’m all for expanding my literature horizons, but not at the expense of missing out on the fun stuff too. — William Ottens is the Cataloging & Collection Development Coordinator at Lawrence Public Library.